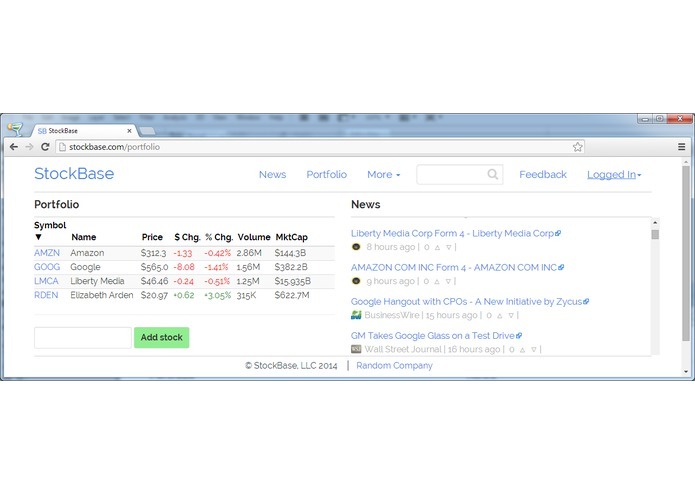 Once a user signs up, they add stocks to their portfolio. We curate a set of about 70 hand-picked newsfeeds, identify the companies mentioned in the articles, and add those articles to the user's portfolio of news. Plus, we parse SEC filings, and add those to the per-company news too. The two of us were learning a bunch of technologies at once: Meteor, MongoDB, Bootstrap, cheerio, various queue management packages and NLP APIs; plus one of us was coaching the other on programming in general and JS and Meteor in particular. It was the first time we were working together, and this was our first large Meteor app. Yet, we managed to put out a product in only three months, and Meteor was a big part of that success. This simple architectural decision ensured the front-end app was always ready to serve requests; the backend could be independently restarted if needed without taking down client connections; and there would always be data in the database, even if a few minutes stale in case the backend choked on a particular news feed. If you're passionate about stocks and software development, please contact us!